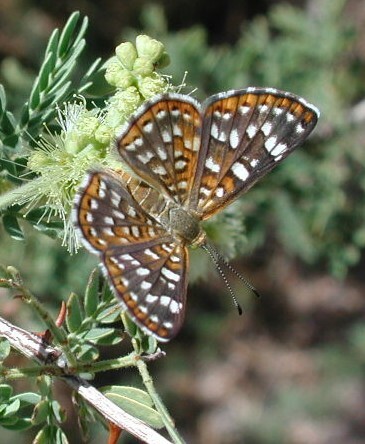 This butterfly was photographed using a Nikon CoolPix 990 on 25 Aug. 2002 n. of Carefree, Arizona. It is taking nectar from flowers of Catclaw Acacia -- Acacia greggii. It has a wingspan of roughly 18 mm. Metal-marks are mostly small to very small butterflies yet they are arguably the most beautiful. They are fond of sipping nectar at flowers making approach with a camera easier. They are also frequent at the flowers of Seep Baccharis -- Baccharis salicifolia. The jade-green caterpillar feeds on leaves of mesquite and catclaw acacia generally preferring the new leaves of spring or the flush of leaves that again appear after the start of the summer monsoon rains.